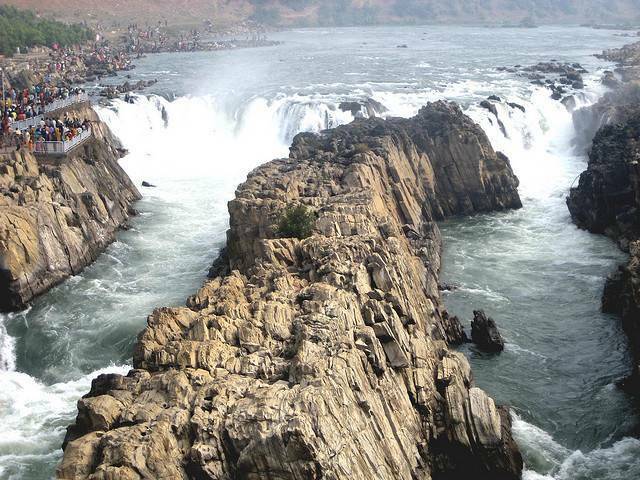 The gushing waters of Narmada River form the picturesque waterfalls called Dhuandhar Falls at Bhedaghat near Jabalpur. It is at a distance of about 30 Kms from Jabalpur and it is one of the most popular tourist destinations around Jabalpur. The foamy mist that forms when the waters gush rapidly give a mystical foggy effect, hence the name 'dhuan dhar', which literally means foggy stream. Now there is a rope-way which crosses over the falls and takes visitors to the other side of the falls and the experience is truly magical. Cable Car Service can be taken from either east bank or the west bank of the river. A boat ride on the river is another amazing activity here. Boat takes you around rock faces of pure white marble. Around sunset these marble rocks appear yellow adding to the charisma of the place.